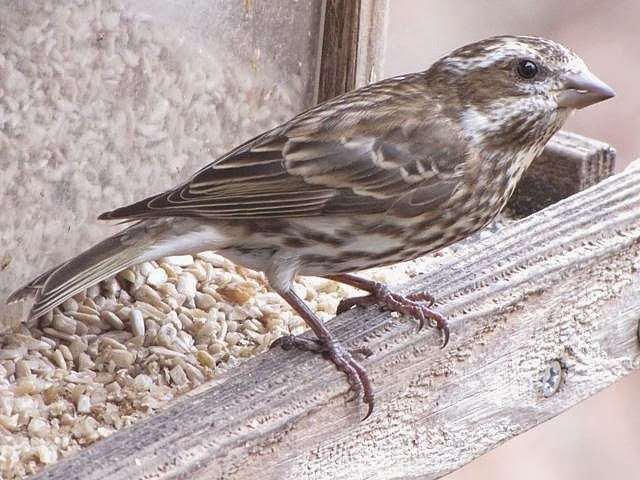 As a follow-up to the Winter Finch Forecast and as a prelude to some really cool air coming into the area this weekend, here is a short discussion on how to identify the two most likely winter finches that may be seen. 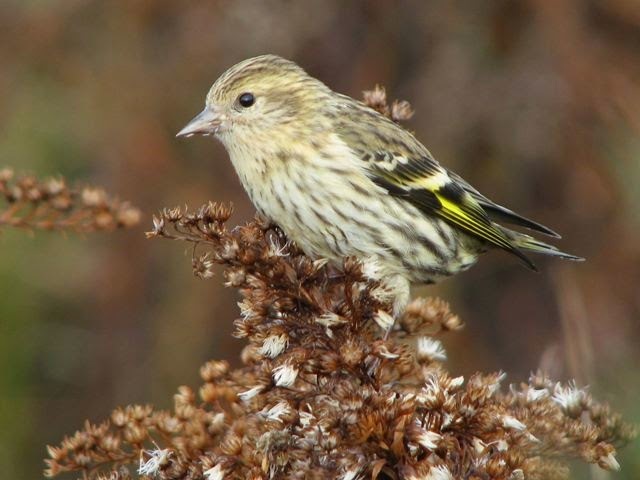 This pine siskin shows the typical streaky plumage, strong wing bars and yellowish patches on the wings. This yellow may be very pronounced in some individuals and more muted in others. Photo by Jeff Lewis. Time to Start Looking for Winter hummingbirds! It’s almost November first! Time to talk hummingbirds! For those of you who have been reading my Observer column for a few years, you should know what I am talking about. For those of you who may be new readers, this may strike you as an odd time of year to be discussing hummingbirds. Not so. For the most part, our ruby-throated hummingbirds departed the southern piedmont around October eleventh. The water level in my feeder hasn’t moved since then. There may be a few ruby-throat stragglers still, but they will almost certainly be moving on soon. 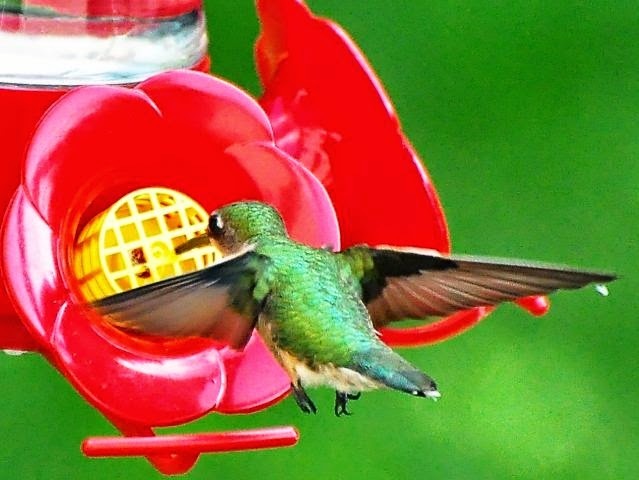 If you are still seeing a hummingbird at your feeder, you need to take a close look at it. Any hummingbird seen in Mecklenburg County after November first is much more likely to be a species that has flown in from the western United States. I suspect there are some of these long-range visitors with some of you right now. Please let me know if you are still seeing one. As November wears on the likelihood of a hummingbird visiting you will increase. Keep your feeders up and maintained. Watch for fleeting visitors or dropping water levels, especially after the passage of strong cold fronts. Last November I received a dozen messages that hummingbirds had arrived after the passage of an unusually strong front mid-month. 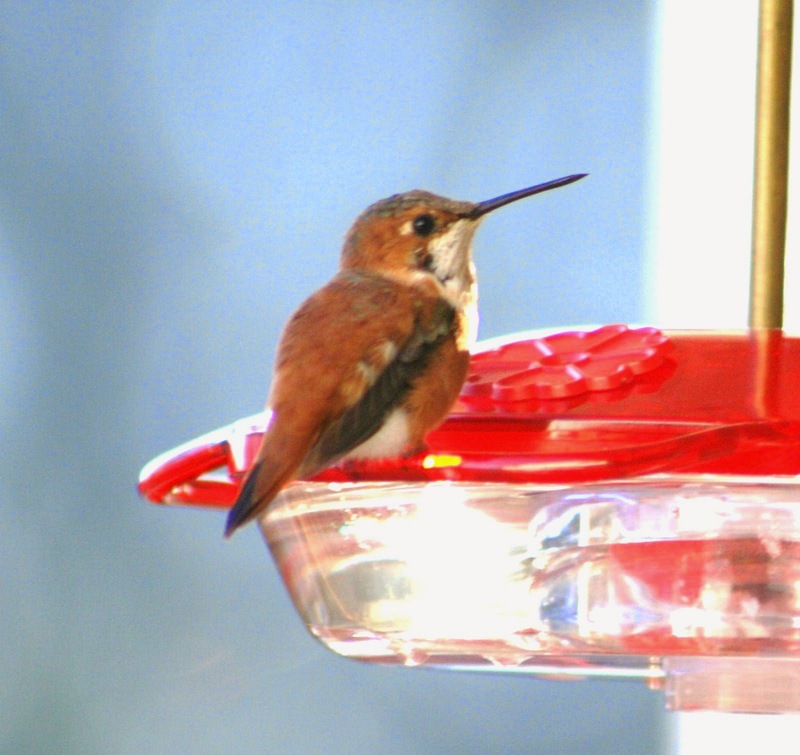 By New Years Day I had records of over thirty-five hummingbirds visiting feeders in the area. Some birds decided to move on after a day or so but some ended up staying almost to April, departing just in time for the ruby-throateds to come back. The most likely species that you might see will be the rufous hummingbird. Males are pretty unmistakable, being almost all red. 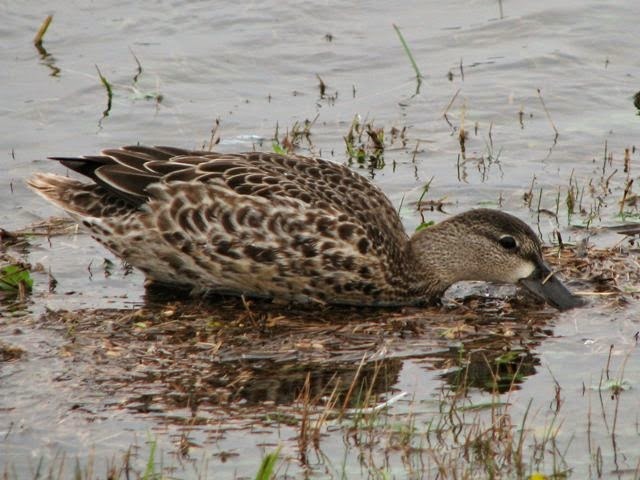 The females and immature, which are the most likely to be seen are more challenging to identify. Look for some reddish coloring on the flanks and around the tail region. If you get one, take a photo if possible and send it to me. I will be writing more about wintering hummingbirds as the season goes on, providing updates on numbers and locations. Compare the two species in the photos below. In this photo of a female rufous hummingbird, notice the reddish plumage on the flanks and on the sides of the tail. This color is something to look for when examining late fall and winter hummingbird visitors. This is the most likely plumage these birds will be exhibiting. 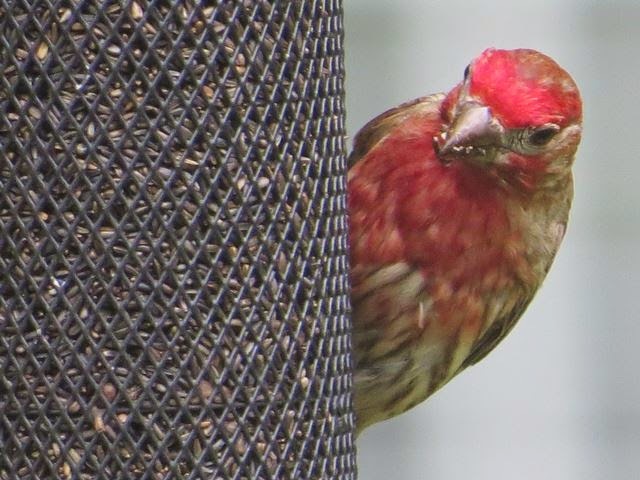 Every fall serious birders, both field birders and backyard feeder watchers, wonder what the coming winter will bring in the way of migratory and irruptive northern finches. 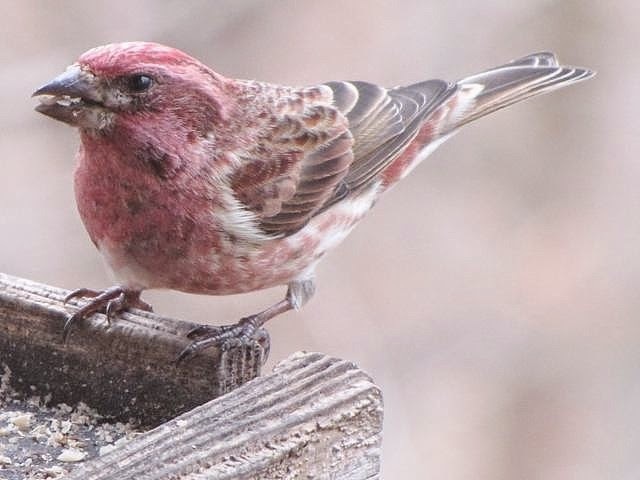 The movements of northern finches such as pine siskins, purple finches, common redpolls, and crossbills can vary widely and wildly from year to year. 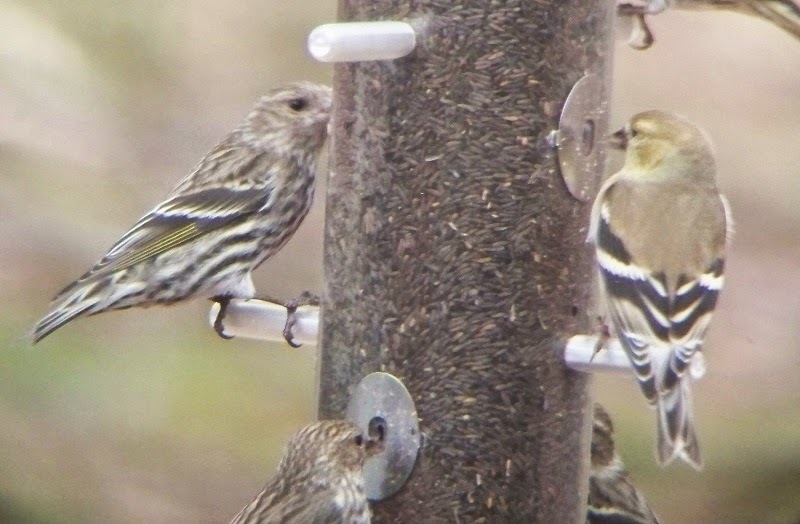 For example, in some years pine siskins may dominate feeders even as far south as the Carolinas. In other years they may be completely absent. Movements tend to be based on the availability of food produced by northern conifers. 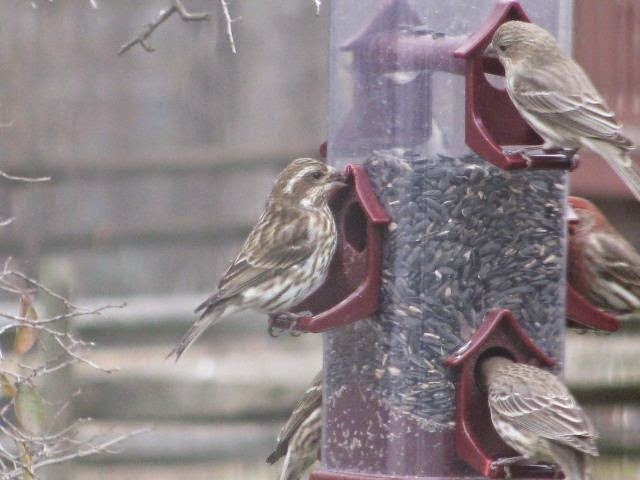 The better the yield of seeds the more likely the birds are to stay to the north. Poor yield or crop failure results in birds moving around more. And it really isn't limited to just finches. Other species like red-breasted nuthatches, waxwings, and blue jays are affected too. 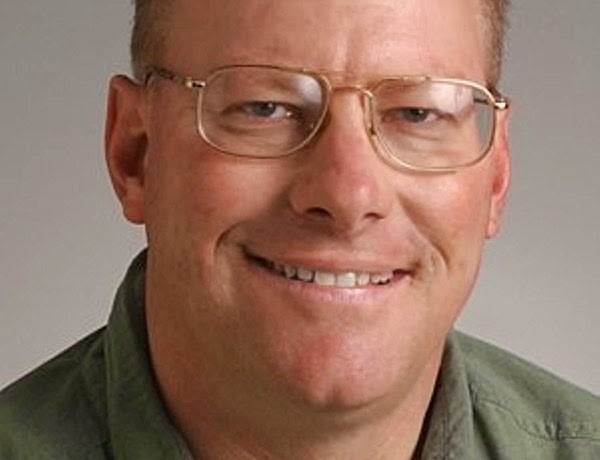 Ron Pittaway released his Winter Finch Forecast for 2014-15 recently. Though predictions are generally for the northern and northeastern United States, some insight can be gained into what species we might expect to encounter here in the piedmont of the Carolinas. 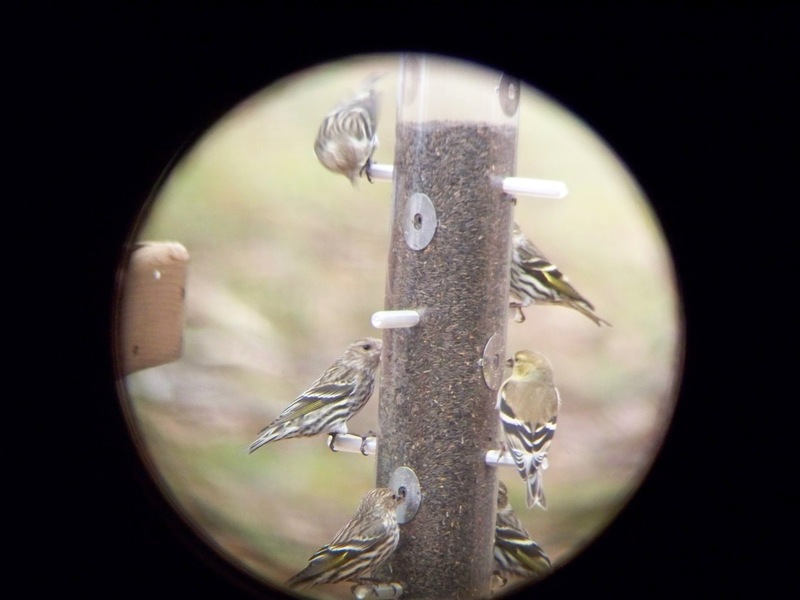 Maybe some pine siskins, shown here with a lone American goldfinch, will put in appearances at local feeders this winter. Stepped outside this morning at 5:30 AM and was greeted by the sounds of numerous nocturnal migrants passing overhead. 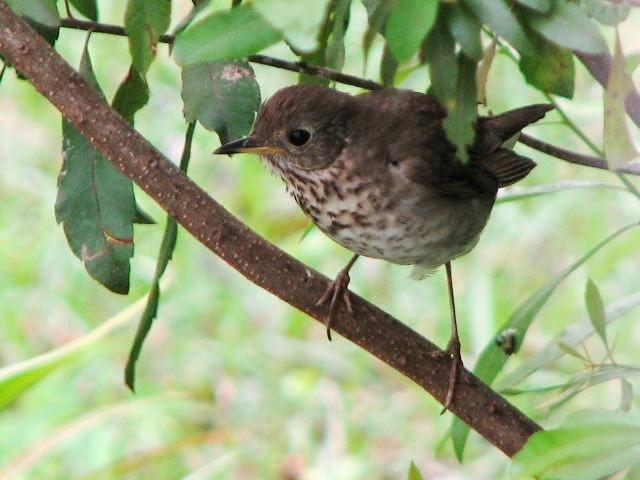 Most dominant were Swainson's thrushes, gray-cheeked thrushes, and rose-breasted grosbeaks. There were others but I am sorely out of practice deciphering the short, variable calls of the migrants. Try it yourself. If you are an early riser, listen outside for just a few minutes around 5:30-6:00 AM. You can also hear them anytime after dusk through the night. You will know pretty soon if its a good migration night. You will hear birds. If you don't hear any after just a minute or two, try again the next night. Below is a link to hear some thrush calls; as well as some other migrant grosbeaks, warblers, and tanagers. The strong cold front that moved in last weekend was of the stuff birders live for. Since August serious birders have been waiting for the first strong front of the season. Oh, there have been some mini cool downs that caused some birds to move but the season had been notable for the absence of cold fronts with northwest winds. Such fronts sweep out migrants present prior to the passage and sweep in new ones. The birding landscape can change literally overnight. Birders well know this phenomenon and take advantage. Last Saturday I was on the shores of Lake Norman off Exit 30 at Davidson. At daybreak I saw tightly packed flocks of both blue-winged and green-winged teal, some numbering over sixty individuals, flying high and low over the lake. For about an hour a flock of teal was never out of my sight. These hundreds ducks were pouring into and through the piedmont as a result of the stiff northwest winds. I also saw my first pied-billed grebe of the season and four common terns blowing around in the winds, also a season first. The next day even more changes were evident. Winter birds appeared in the feeding bands of migrants. Yellow-rumped warblers, yellow bellied sapsuckers, and ruby-crowned kinglets replaced species that had departed. The front ushered in the first wave of sparrow migrants too. At Veteran’s Park I found the season’s first sizable chipping sparrow flock, a group of about twenty-five birds. For weeks Eastern wood-pewees had been a numerous and conspicuous migrant. Eastern phoebes had been present in small numbers. After the front passed the numbers of these two species switched. Pewees became scarce while the phoebes became the dominant flycatcher seen. This fall I have seen more white-eyed vireos than any other year that I can recall, yet they were totally gone by Sunday. Small migrating flocks of blue jays could be seen winging slowly and steadily overhead, while migrating chimney swift numbers increased dramatically too. There are still a few ruby-throated hummingbirds hanging around but their numbers took a nosedive too. I expect the numbers to have further declined by this weekend. Next, the sparrows and winter hummingbirds will arrive. More on that development in a few weeks.